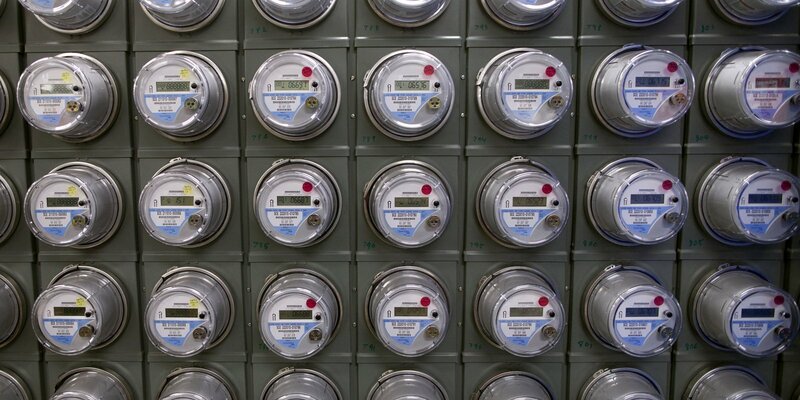 A bank of 'smart' electric meters in Southern California, U.S. Image: Bloomberg via Getty Images. Electricity means power. That, at least, has long been a common English usage – think of power stations, power lines, power companies, power systems. People use the word ‘power’ as a direct synonym for electricity but it is far more than electricity. Power is one of the most important concepts in human society. On a personal level, power is the ability to do what you want to do. On a social level, power is the ability to make others do what you want them to do. How did electricity become power? How does electric power interact with other aspects of power? As the world's electricity undergoes a dramatic and hectic transition, what might the transition imply for power in global society? Disputes about electricity policy, planning, investment and the associated costs – and who pays them – have always been couched in economic terms: which option is cheapest, offers the best value for money and so on. But such disputes are first and foremost political – a struggle for power between different participants in electricity systems. Even the putative economic evaluation depends on who is evaluating and how. Throughout the first century of public electricity provision, until the 1990s, in the many confrontations that occurred around the world, the power almost invariably lay with centralized agents – governments or franchised monopoly companies or often both – rather than with individual citizens and electricity users. The siting of a transmission line, dam or power station, the choice of generating technology, the control of emissions, the disposal of waste and safety concerns were all decided by these centralized agents regardless of public opposition. So was the cost users paid for electricity from the public system. Captive customers of monopoly power had no choice. Throughout the first century of public electricity provision, power almost invariably lay with centralized agents rather than with individual citizens and electricity users. Captive customers of monopoly power had no choice. The situation was akin to the status of telecommunications. Throughout the world, telephone systems, whether state-owned or private, were franchised monopolies that laid down stringent restrictions on their customers. Later governments began to break up these franchised monopolies and to liberalize telecommunications. Then along came the internet, wireless mobiles, tablets and smartphones, which within two decades caused a spectacular transformation. Customers who had been effectively powerless under the traditional regime found that they could now choose providers and types of connectivity, communicate by text, voice or video over any distance, access information and entertainment at will, and collaborate with others anywhere – powers previously in the realm of science-fiction. A similarly rapid, comprehensive and disruptive transformation is now happening to electricity. Driving it is a combination of technological innovation and institutional upheaval. The technological innovation is affecting not only generation but also networks and end-use equipment and the software linking them – a striking reorganization of system configurations, the facilities involved and where and how they function. The corollary is an equally striking shake-up of regulatory and business relations. The overall effect is a gradual but unambiguous diminution of the power of the traditional centralized players, the rise of new centralized players and a gradual but accelerating increase in the power of those previously at the edges of the centralized system. Three Gorges Dam is the largest power generating facility ever built. The titanic project has flooded 2800 square kilometres and displaced more than 1.3 million people. NASA scientists calculated that shift of water mass stored by the dams would increase the length of the earth's day by 0.06 microseconds and make the earth slightly more round in the middle and flat on the poles. The traditional centralized model assumed huge remote generators feeding long high-voltage transmission lines carrying large currents in one direction via local distribution networks to passive loads on the premises of users. The rise of reliable smaller-scale generation broke the mould: gas turbines in combined cycles; gas engines offering cogeneration or even trigeneration, electricity, heat and cooling; then wind power; then photovoltaics, among others. The rise of wind and solar power – both fire-free forms of generation – reduces system dependence on fuel, with its variable and unpredictable future costs and its inevitable environmental impact. Innovative generation has been accompanied by innovative network facilities and corresponding software – including Flexible Alternating Current Transmission System (FACTS) and high-voltage direct current (HVDC). These network technologies still fit into the traditional decision-making power structure, with investment and management by large centralized players. But they also foster more flexible and versatile system configuration and operation, loosening system boundaries and making existing assets more amenable to reorganization. 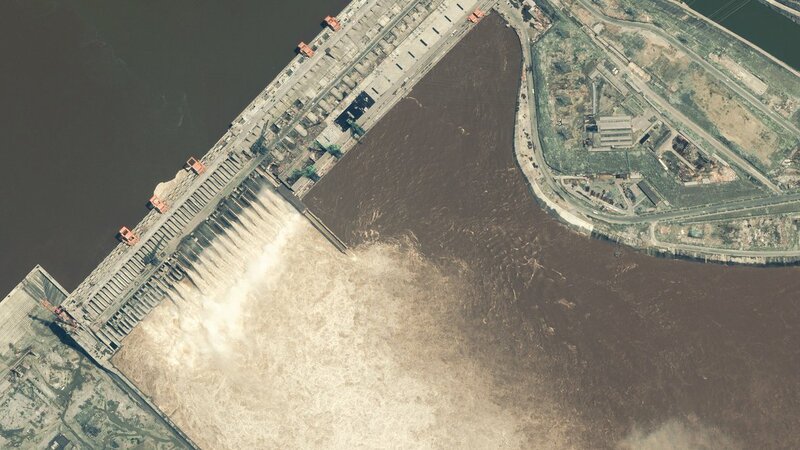 Satellite image of Three Gorges Dam, China. Completed and fully functional by July 2012, the total electric generating capacity of the dam is 22,500 MW. Image: DigitalGlobe via Getty Images. As this technical evolution continues, in more and more places the traditional system is gradually turning into a more decentralized configuration, with smaller units of generation, many of these closer to users with users themselves becoming generators. A yet more disruptive technical innovation is also coming into play – affordable battery storage at scales from household to substation. The abundant technical options now available offer the opportunity to set up complete and coherent, integrated and optimized local systems, including generation, networks and high-performance loads, all communicating with one another in so-called 'microgrids'. Such a microgrid may be connected to a traditional system. It may, however, be free-standing and able to operate independently, either in emergency ‘island’ mode or as a normal complete system. As more microgrids emerge, they may in turn be interconnected for load-levelling and backup – effectively a ‘federation’ of microgrids with operating, management and financial arrangements far removed from the traditional centralized power structure. Microgrids in rural settings, controlled by and serving local people, are already emerging in Southeast Asia, and they present major opportunities for other parts of the world beyond the reach of traditional networks. Can these regions, including more than a billion people still without electric light, establish decentralized village microgrids to leapfrog traditional centralized electricity and its institutional power structure? The potential is enormous, and obvious, but the centralized players are still mostly stubbornly opposed to such loss of political power, despite their inability to deliver. Built on evidence from on-the-ground projects, the Moving Energy Initiative works to achieve access to clean energy for refugees and displaced populations. 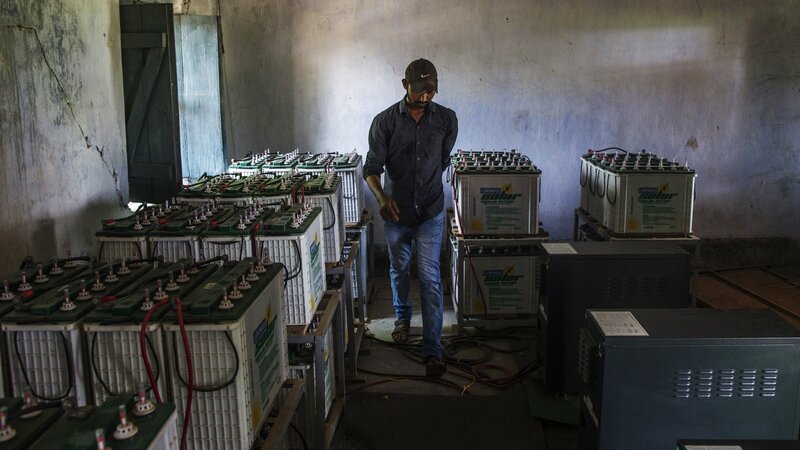 An employee walks past batteries at a solar power microgrid power station in the village of Dharnai in Jehanabad, Bihar, India. Image: Prashanth Vishwanathan/Bloomberg via Getty Images. The rise of renewable power and the drive for electrification means energy security is also about electricity access via interconnected grids and decentralized solutions. These new business models and consumer preferences require new forms of collaboration, argues Bernice Lee. Gradual decentralization of the technical model of electricity systems brings with it a parallel decentralization of decision-making power, disrupting the institutional arrangements of traditional electricity. New players, such as universities, airports, hospitals, shopping malls, office blocks, communities, villages – and even single individuals – acquire the power to invest in and to connect and control electricity facilities. Not just user technology but generators, networks, software and entire systems. They also acquire the power to select and to change business partners as well as the types of business activities and relationships, and, not least, to refuse an offer. These new decentralized powers gravely threaten the business model of the traditional centralized players. They also offer an appetizing menu of potential opportunities for new business activities and relationships for the traditional players and the new arrivals. In the Netherlands, for example, the green energy company Vandebron links many small-scale solar, wind and biomass generators with users of electricity. The generators decide what they want to charge and the users decide whose electricity they want to buy. This peer-to-peer relationship is still novel for electricity but could become much more common. Thomas Edison's one-time secretary, Samuel Insull, called electricity a 'natural monopoly'. He argued that installing more than one set of wires from a central generator in a neighbourhood made no economic sense. But he also argued that the sole permitted electricity supplier - the 'monopoly franchise'- had to be controlled by a regulator to prevent the abuse of captive customers - the origin of electricity regulation. Decentralized and differentiated technical configurations will also entail profound changes in the prevailing institutional framework for electricity, which may not be welcomed by those who as yet still exercise most of the relevant economic and political power. One striking difference, arising from the altered technical configurations of innovative electricity, is that Samuel Insull’s ‘natural monopoly’ argument that a locality could economically justify only one set of wires, no longer applies. The ‘natural monopoly’ argument gave rise to the ‘regulated monopoly franchise’ concept. The inevitable corollary of decentralized electricity must be a fundamental rethink of the very idea of regulation and with all that that implies for political and economic power. The traditional unilateral electricity transaction essentially offered users a ‘Hobson’s choice’: take it or leave it. The new entrepreneurial context will be a dramatic break with that unequal tradition. Users will have the power to negotiate and interrogate prospective providers and to also select the best option. That in turn may entail different business relationships based, not on short-term commodity transactions, but on longer-term contracts between providers and clients, and not on selling kilowatt-hours but on providing the services people want. Instead of the lopsided power wielded by the suppliers of traditional electricity, in these new relationships, the balance of power ought to be more or less equal, with contract terms offering mutual benefits to both parties. Although the electric transformation is taking place mainly for sound business reasons, its emphasis on higher-performance gas-fired generation, especially cogeneration and trigeneration, plus entirely fire-free wind and solar generation, may gradually but unambiguously reduce the hitherto vast and dominant economic and political power of traditional fuel suppliers. Gas-fired and fire-free electricity undercuts the power of the coal industry; electric vehicles undercut the power of the oil industry; better buildings in whole-system upgrades undercut the power of the natural gas industry. What is emerging is a contest of electricity versus fire. Some power is gradually being decentralized, but large-scale wind and solar fire-free generation is also becoming ever more significant. The demise of internal combustion vehicles is in sight, with electric vehicles poised to replace them. But the cost and scarcity of critical metals could prove a major hurdle. The struggle under way is thus intensely political. Politics, not economics, will determine the course of electricity’s evolution. Power will determine where, how and how much money is invested. Power will determine how revenue flows and to whom. Some new players, large and small, will be winners. Some traditional players, previously large and unchallenged, may be losers. But they will not go quietly.